Whew, it’s been rough around here with the Rocket Family! I had all three kids come down with a nasty case of Hand, Foot, and Mouth, and I got it right along with them. So there hasn’t been much time for crafting or blogging with all of that misery. 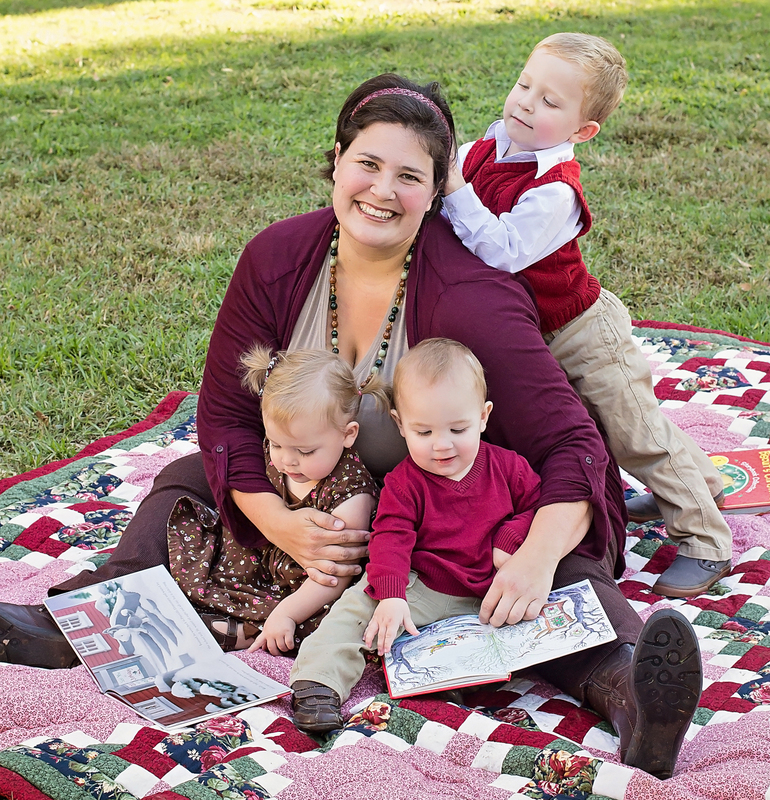 Fortunately, everyone is healthy again and back in preschool, and I’ve got a new project all ready to share with you! 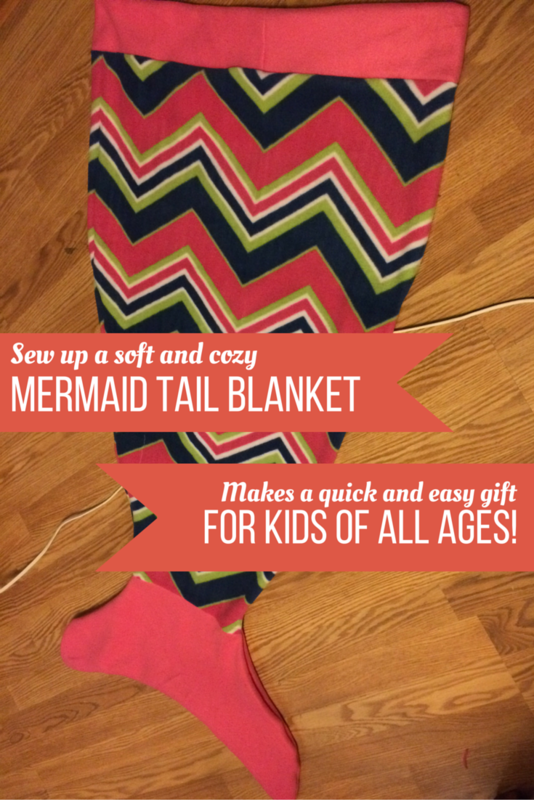 You’ve probably seen the mermaid tail blankets that are crazy popular for kids right now. People are crocheting them, knitting them, and sewing them out of a variety of materials, and there are a million different versions for sale on Etsy. And they’re super cute! So I wanted to try and put together an easy version of one – I thought it might make a fun gift for my kids, and possibly some of our friends and family too. My kids are still small enough that I can work primarily with fabric from the Joann’s remnant bin, which is AWESOME. I bought the fabric for this particular tail for about $6 total! 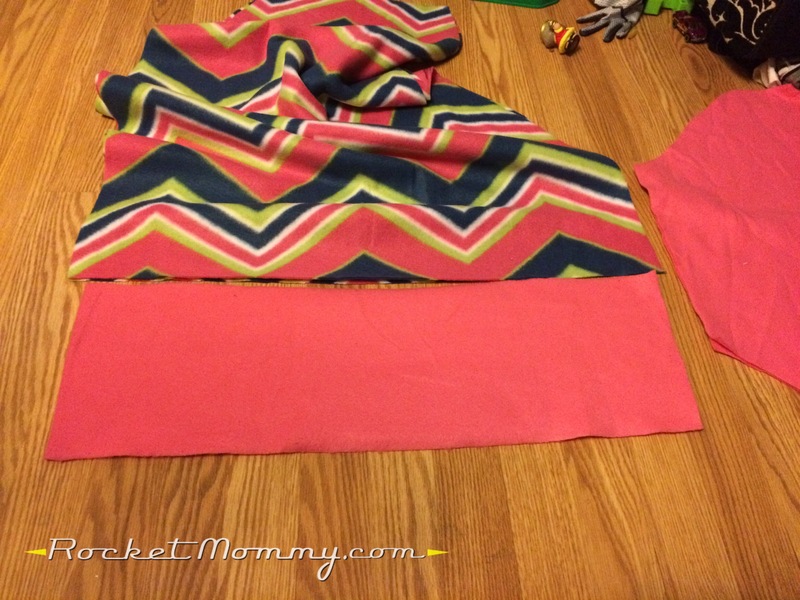 It took one yard of one fabric and about half a yard of another. This was the tagged price, but fleece was on sale for 40% off, and then they take another 50% off because it’s a remnant. Score! So, here we go. I didn’t make a pattern, I just measured, marked, and cut. So I hope this is easy enough to follow! 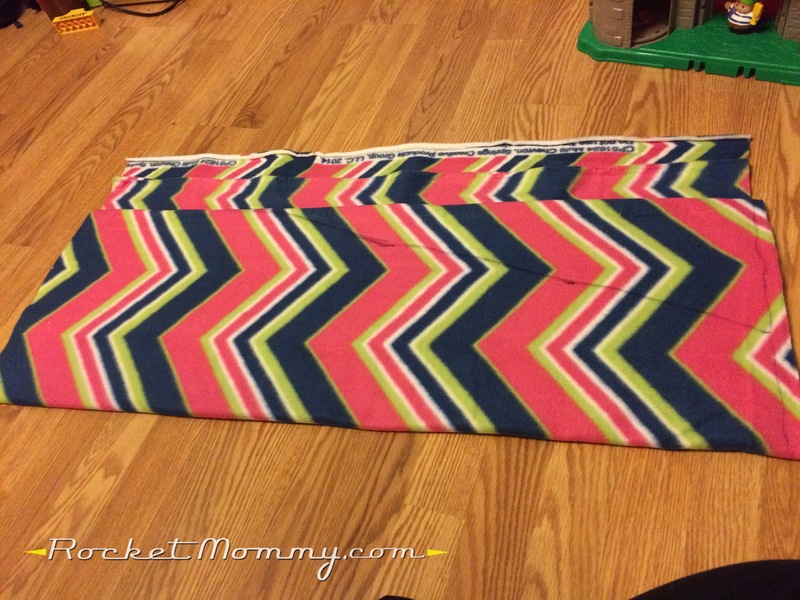 First, I took my yard of fleece, folded it in half, and laid it out. The body portion of the tail is going to end up being approximately 24″ wide and 36″ long, so I made sure that it was at least that size when it was doubled over. 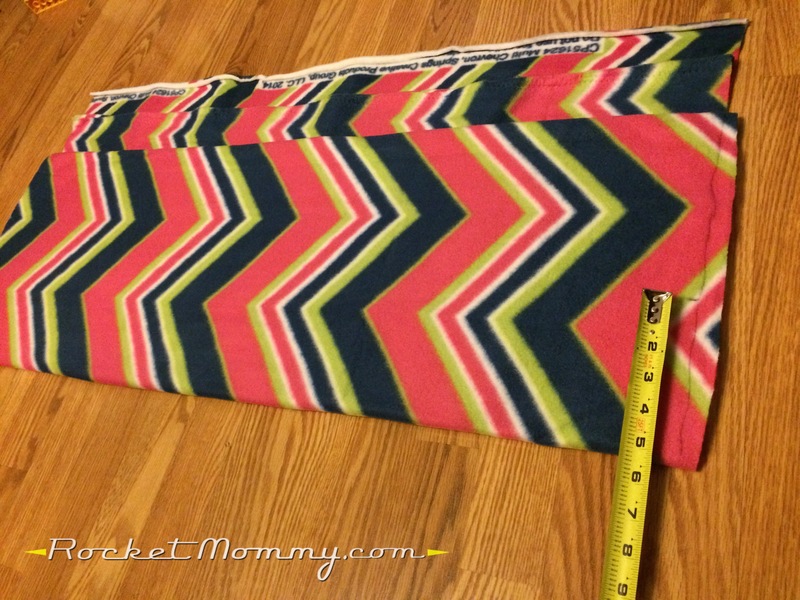 This fleece was 59″ wide on the bolt, so in this picture it’s about 36″ long and 28″ wide. 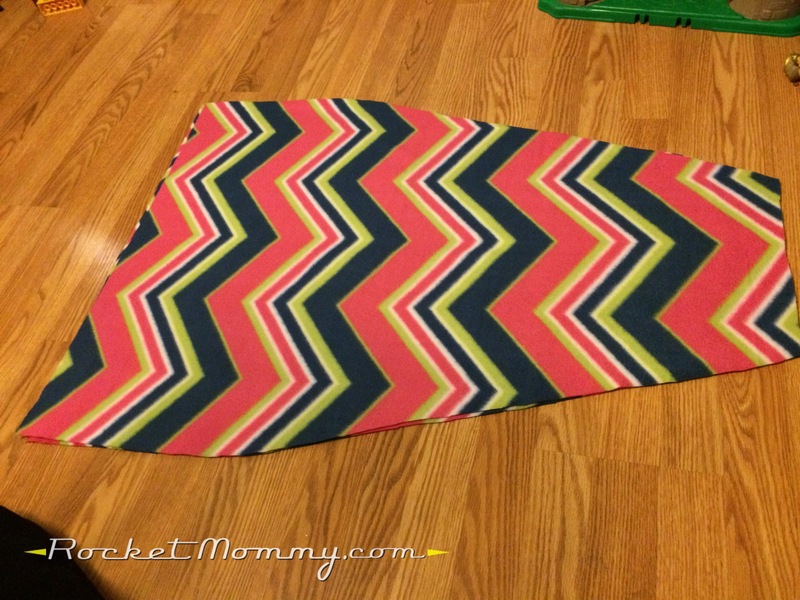 Then I folded the edge over, so the part I was working with was 12″ wide x 36″ long. 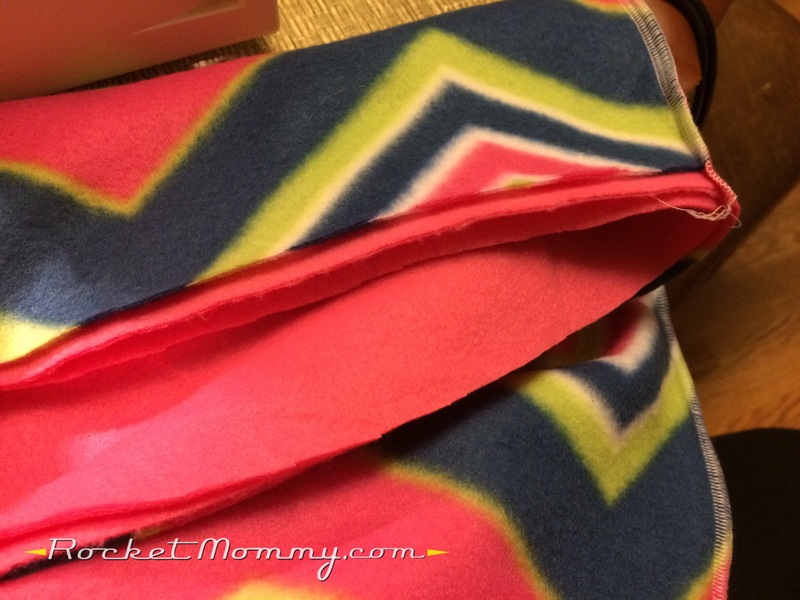 Because this fleece has a pretty bold pattern on it, I wanted to keep the chevrons centered and lined up as best I could on the front and back – if you use a plain fleece or one with a smaller pattern, that won’t be an issue. Now we’re ready to start marking and cutting. 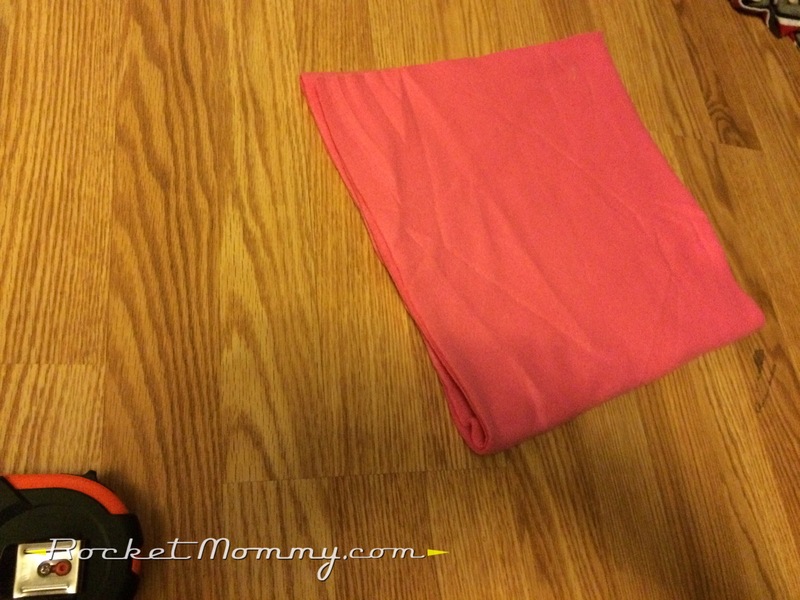 The top edge is going to be 24″ when you unfold this, so no need to mark anything there. I started with the bottom of the tail instead. When I sketched it out, I figured I’d want the bottom to be about 10″ wide, so I made a mark at 5.5″ from the fold (that gave me about a half inch seam allowance). I also took this opportunity to mark where I needed to trim some unevenness from the bottom, as you can see here. 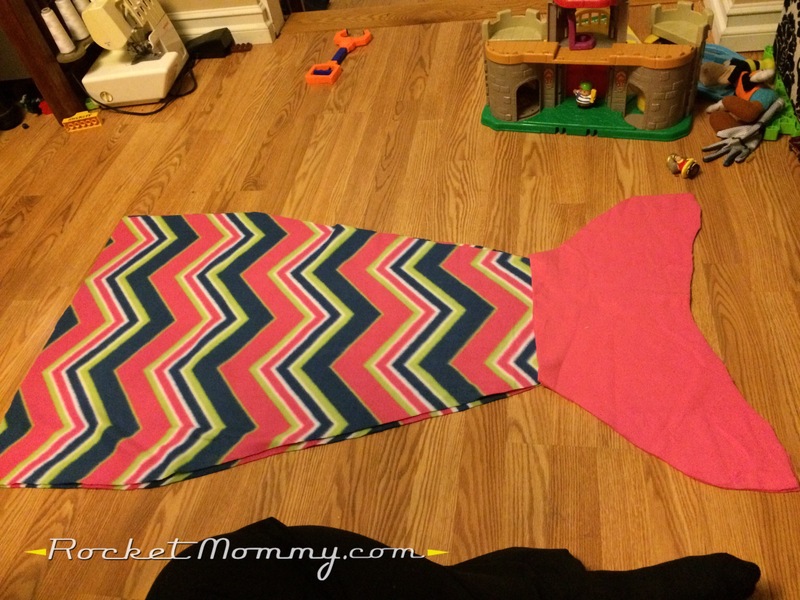 Next, I knew that about halfway down the body of the mermaid tail I wanted it to be 20″ wide. So I marked it at about 10.5″ from the fold at that point. From there, it’s just a matter of connecting the dots. Draw a line that goes from that top edge to the mark at the bottom, going through the mark in the middle, and try to make it a gentle slope. Now cut along that line, making sure you get all four layers. Now when you unfold it, you’ll see that it’s taking shape nicely! Now we need to cut out the piece for the fin. 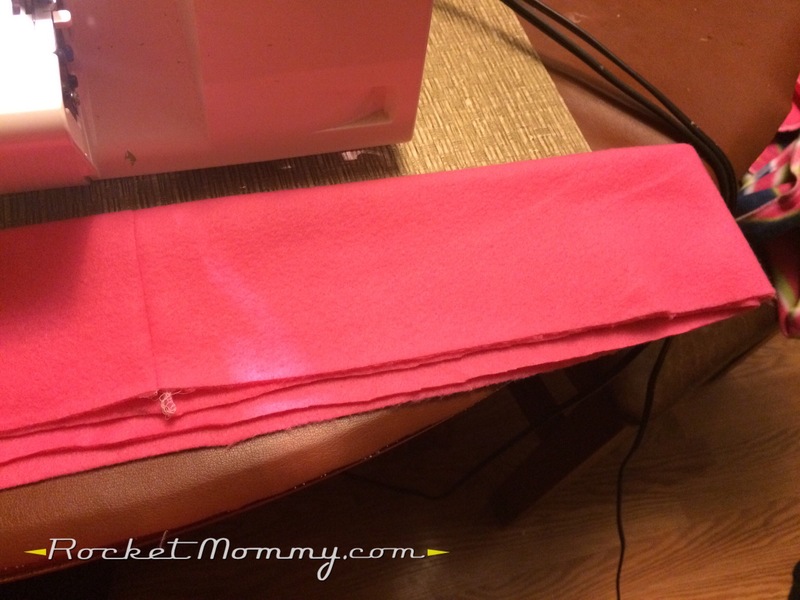 I planned it to be 12″ long and 24″ wide, so I took my contrasting color of fleece, folded it in half, and cut that doubled piece down to 12″x24″. 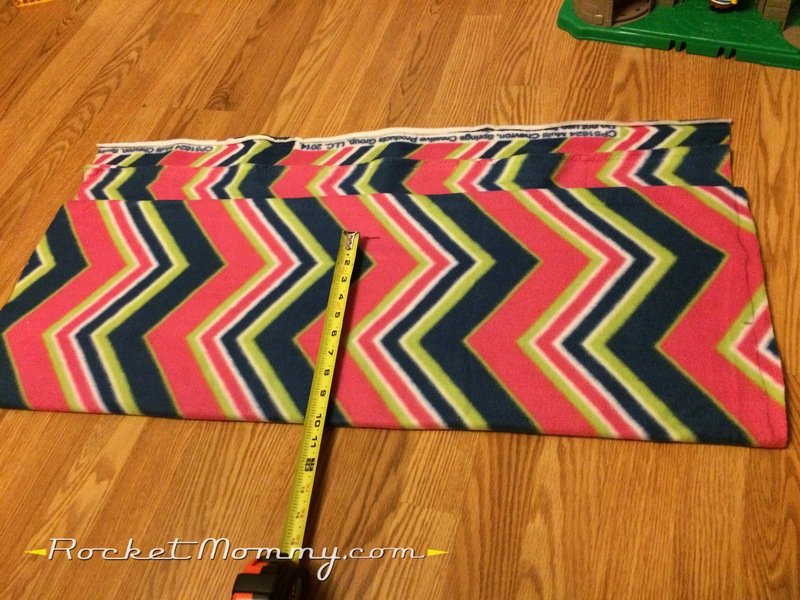 Now, fold that piece in half so it’s 12″x12″. This probably looks complicated, but it’s actually pretty simple. Keep the fold at the bottom (the edge that’s marked 9″ and 3″). 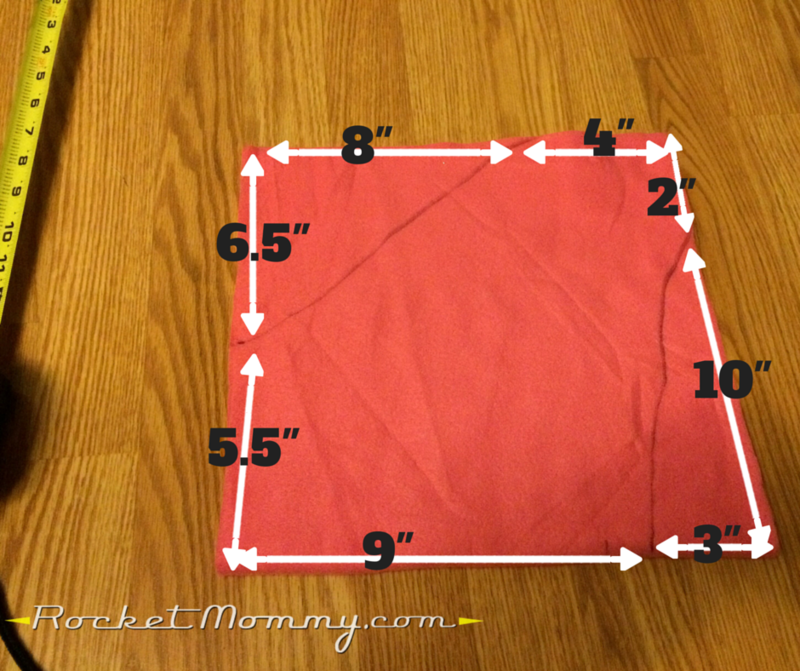 Measure and make a mark on each side of that 12″x12″ square as shown below. Then draw lines to connect the two sides. You’re going to cut along those lines and discard the pieces. When you unfold it, you’ll have a lovely little fin to attach to the bottom of your blanket tail. 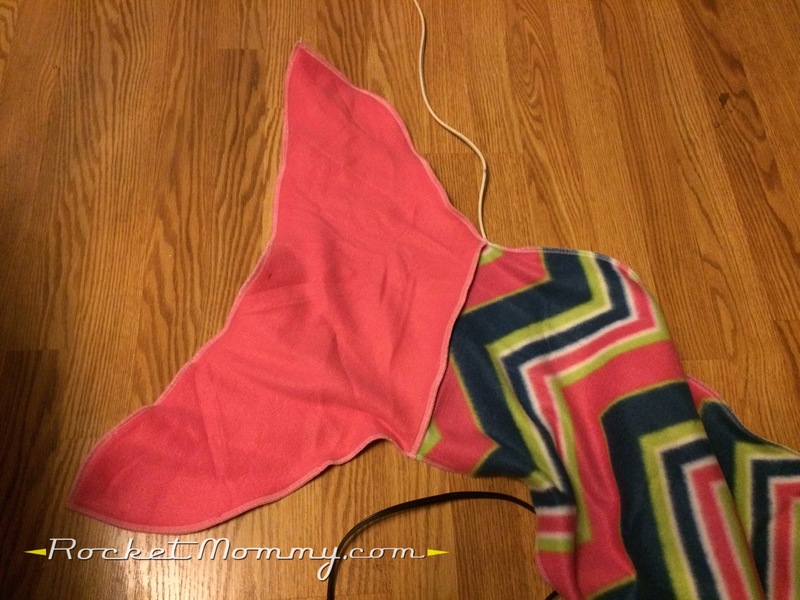 I had just enough pink fleece left to make a waistband for this blanket, but I think it’s optional – you could just as easily fold the waist down an inch or so and sew it down. 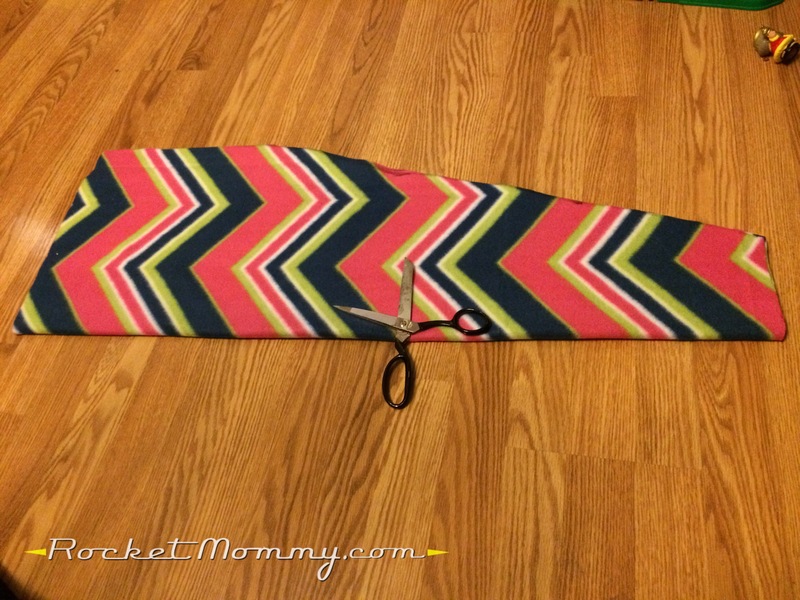 But if you’re going to add a contrasting waistband, you’ll want a strip of fleece that’s about 6″ wide and 48″ long. Mine is folded in half below. Now it’s time to sew! Start by attaching the fin pieces to the bottom of the tail pieces. 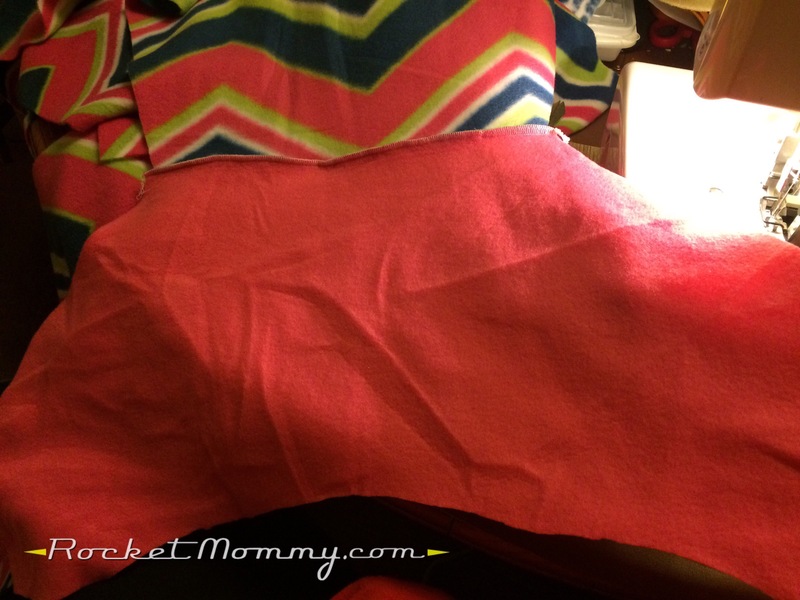 I used my serger for everything (because I LOVE using my serger for EVERYTHING! ), but a regular sewing machine would be perfectly fine. Next, sew the long seams up the sides of the whole thing. Pay attention to what direction your pieces are facing! 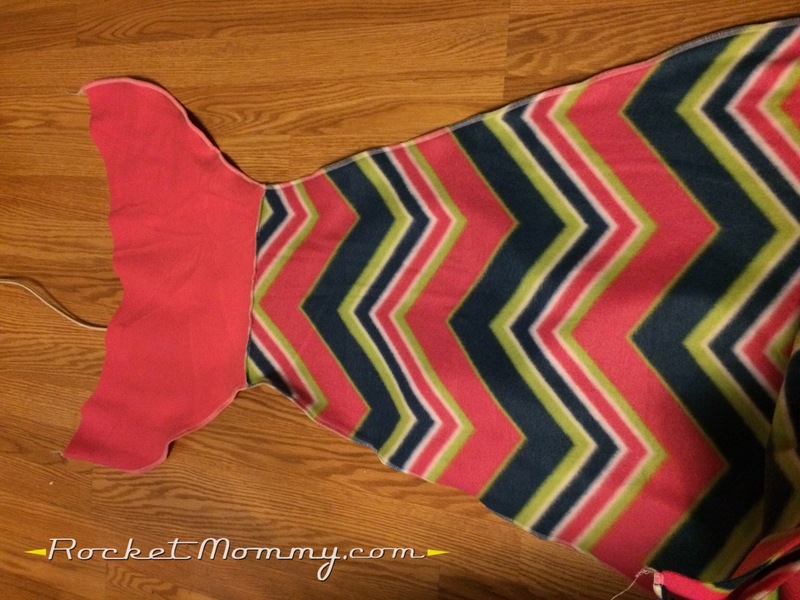 You want to keep the right sides together and keep the seams you’ve sewn on the outside for now. 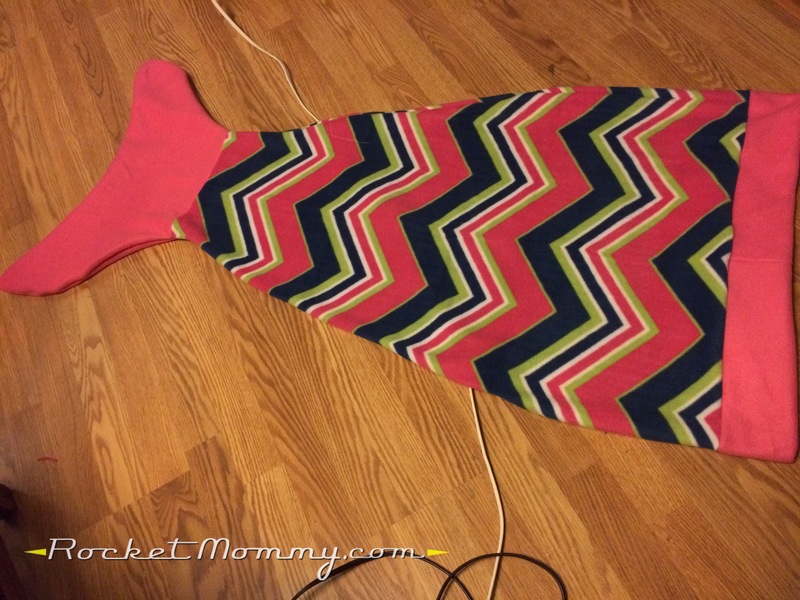 Then sew along the bottom of the fin. 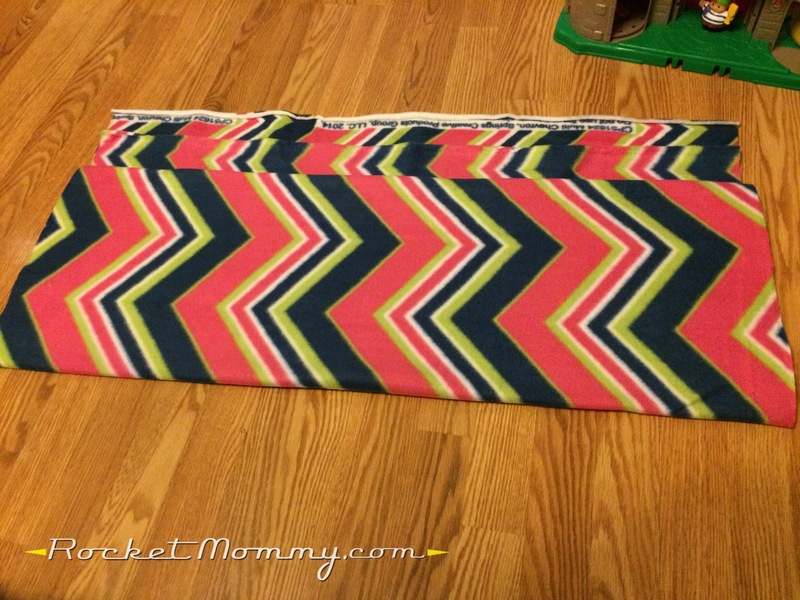 Now, if you don’t want a different waistband, you’re pretty much done! But if you do, then take that strip you cut and sew the short ends together so you have a loop. 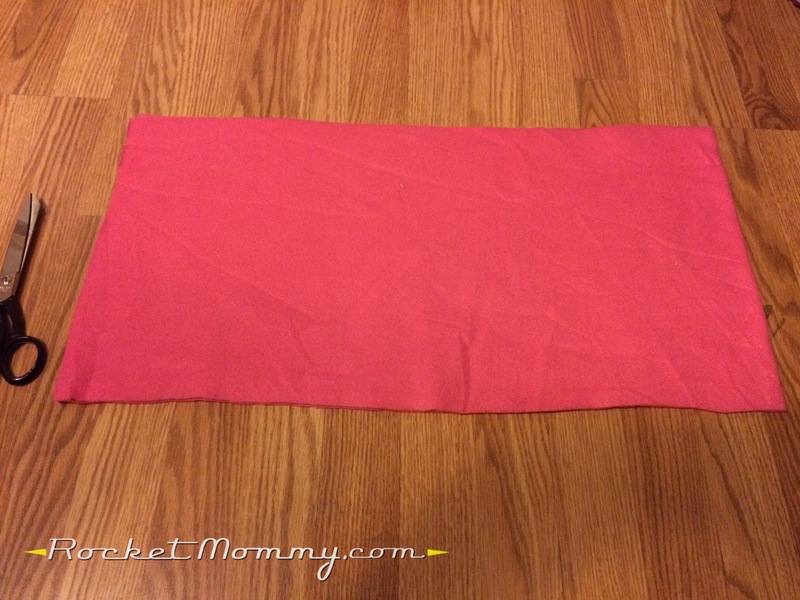 Then fold it in half so the seam you just made is on the inside and the long edges are lined up (it will be about 3″ wide after this). Take this waistband and put it inside the waist opening of the tail (which is still inside-out), matching up all the cut edges. You’re going to sew it on, making sure to catch all three layers all the way around as you go. And you’re done! Go ahead and turn it right-side-out, and admire your handiwork. It’s a pretty generous size, and it will definitely allow a kiddo to curl up inside it and snuggle. And it seriously took all of one hour to make, from start to finish. Go hit up the remnant bin and give it a try! Thank you for the great directions! I just whipped a tail together for my granddaughter, and can’t wait to give it to her. I did leave the bottom of the tail open, though. She is 6, and I figure she’s going to be walking around in it, and she tends to be hot all of the time, so she can stick her feet out. I’ve been dreading making this, but when I found your directions, I knew it didn’t have to be a long, drawn out project. Super! I’m so glad it worked out for you! Leaving the bottom open is a great idea, too! Hiya, Id like to try the Dory pattern, but Im a bit confused; So I’d cut 2x bright blue to the tail shape (back and front) and one piece of darker for the detailing? Is the inside rough? I purchased some fabric, and the outside is much softer, I’m considering lining it?? Please help…..my long list of Christmas projects abandoned is already starting to surmount.